MIGHTY UNCLEAN subverts the masses! It will make you uneasy. It will get under your skin. It will make you feel… Mighty Unclean! 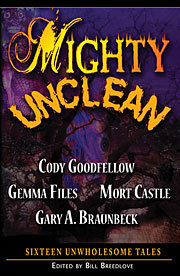 Dark Arts Books’ fifth anthology since 2006, Mighty Unclean debuted in a preview edition at the 2009 Bram Stoker Awards Weekend last month in Burbank, CA. The full print run began shipping in July and like our previous anthologies, Mighty Unclean features several stories each from four groundbreaking authors of the dark and macabre. This time around, you’ll get a sampling of the amazing fiction of Gary A. Braunbeck, Mort Castle, Gemma Files and Cody Goodfellow. Unwell… Cody Goodfellow wants to introduce you to a goddess who offers unsurpassed pleasure – at an unspeakable price. happens when you look too closely into places and things better left unknown. Unquiet… Mort Castle wants to play some unfamiliar music for you… the tunes of the lost and the damned. Undone… Gary A. Braunbeck wants to take you to the edge of madness and perversity… and push you over. To see the full Table of Contents or to order, see the Mighty Unclean page or visit the Store.